in the St Andrew’s Museum as part of the exhibition Hotpot [food, art + people]. 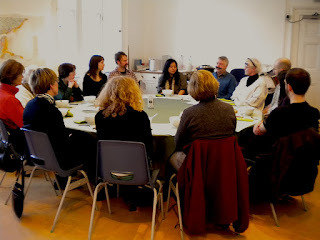 Four soup and conversation events will be hosted in the gallery during the exhibition. 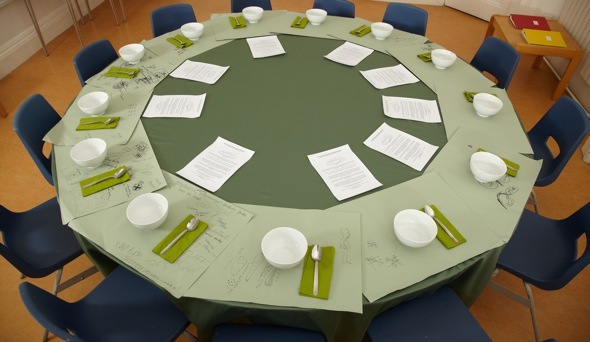 To book your place at the table please contact St Andrews Museum on 01334 659380. This blog will share the ideas, recipes and documentation from the fours events during the exhibition. See http://hotpotart.blogspot.com/ for more info about the exhibition. Mike Small from the Fife Diet Project highlighted some of the issues around what is and isn't available in Fife and the impact of this on health, climate change and the communities we live in. We ate an oatmeal soup with the conversation. Put the chopped vegetables in a pan with a little oil and toss them in it until clear. Add the oatmeal and fry with the vegetables for a few minutes. Add the stock. Simmer for an hour. Add parsley and seasoning. Just before serving, add the milk and re-heat. The concentrated pomegranate flavour adds exactly the right balance of sweet and tart so typical of Persian cooking. If you can’t get hold of pomegranate juice, use really tart fruit jelly. Walnuts were so highly regarded that they were reserved for the kings of Persia; once they were taken to Greece, they became the food of the gods, so voluptuous is their oil. When minced and slowly simmered, they make a fabulous accompaniment to venison; it’s deliciously rich and festive. If using pomegranate juice, put it in a wide pan and boil it down until only 3 or 4 tablespoons of syrup remain. It will be reduced by the time the meat has cooked. Chop the walnuts into small crumbs. Fry them gently in a teaspoon of oil, stirring for about fifteen minutes until they darken, then draw them off the heat. Fry the onion in oil till golden brown, then add the meat and brown that too. Add just enough stock to cover the meat, cover, and simmer gently for 30 minutes. Then add the fried walnuts and simmer for another 30 minutes, topping up with stock if necessary. Then stir in the pomegranate paste (or jelly) and continue to simmer until the meat is tender (about another 30-45 minutes, longer for shoulder). Season with salt and pepper, adding lemon juice if necessary to increase the note of tartness. Serve with steamed spinach and plain or saffron rice. For festive sparkle, strew some jewel-like pomegranate seeds over the rice. The Fletchers contribute to a wide ranging discussion on meat production and consumption, bringing in issues of health, the environment, animal welfare, government support (or lack of), taste and cost. The duck soup suggested by Nichola was made from local ingredients including a wild Fife duck and for my first duck soup was apparently very good (I had assistance from a meat eater). 1. Roast a duck for about an hour then take off the flesh and put to one side to cool. Keep covered and refrigerate once cool. 2. Put the carcass plus two onions, two carrots, stick or two of celery, fresh parsley, a couple of bayleaves, pinch of thyme (fresh f you have it) in a pot, cover with water and simmer for 3 hours until reduced to a stock. 4. Add roasted meat, stock and a handful or two of pearl parley and lentils. Boil until the barley is soft. To book your place at the table please contact St Andrews Museum 01334 659380. Please let us know if you have any dietary requirements so we can provide an alternative soup if necessary. The discussion will be initiated by Nicola and John Fletcher and we will be serving duck soup with false moustaches. Nichola Fletcher is a food writer, food historian and food producer. (She is also a designer and goldsmith but that is another story). One of her specialist interests is meat, particularly game meats. The topics she finds interesting are the cultural aspects of meat-eating, both in the past and now, as well as peoples' perceptions (often erroneous) of what meat-eating involves and the corollary to that: what not eating meat involves. Power, religion, heresy, feasting, joy, denial, survival, climate - all these and more are involved. John Fletcher is a qualified vet who did a PhD from Cambridge many years ago on the deer on the Isle of Rum. They won his heart and made him realise how easily they can be farmed. In 1973 he started a deer farming enterprise in Auchtermuchty with Nichola Fletcher. From the beginning the idea was to produce venison in a way comparable to the many medieval deer parks. John has written a book about their system of producing the meat and the thinking behind it and also pointing out the theory widely accepted by scientists that because humans have been eating game meat for up to 50,000 years this is the meat which they are best equipped to metabolise. John looks forward to discussing a meat that he describes as exquisite and 'ticks all the environmental boxes'. Eva Schonveld runs Transition Scotland Support, which aims to support people who want to use the Transition model to re-localise their communities. This means communities taking back responsibility for feeding themselves and producing their own energy as well as many of the other things we need to sustain ourselves and thrive. This can lead to more local employment, better health, and more fulfilling social relations, as well as being a way to tackle the problems of climate change and the ever rising price of oil. Eva co-organised the first National Local Food Gathering in Dunbar in October 2009, and has been helped set up 'Nourish' the new Scottish local food organisation. She enjoys cooking and specially eating food, and is keen to learn more about growing her own. She has newly moved to Fife with her husband and 3 boys. The discussion will be initiated by Mike Small and we will be serving an oatmeal soup. 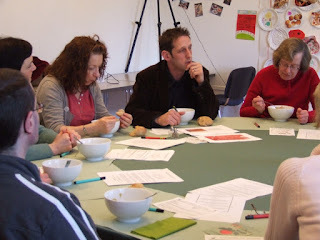 Mike runs the Fife Diet Project, a mass-member food network of people accessing sustainable local food. The project brings people together who want to know where their food comes from and how it was produced, believing that together we can create alternatives to the globalised food system that will be part of our low carbon future. The project aims to help each other re-learn how to eat seasonally and challenge the insanity of food miles. Mike will be talking about recovering our national and local food culture as an antidote to globalisation. Jane is a local producer and produces ‘Anster’ cheese. The cheese is hand-made on the farm – to a traditional recipe – by Jane, using unpasteurised milk from her husband Robert’s herd of home-bred Holstein Friesian cows. The Stewart family are the only farmers in Fife making cheese, and are now in their third year of production. They also have a coffee shop on the farm, and are a 4 star Visitor Attraction with Visit Scotland - so people can come along to see the cheese being made, and then enjoy luch or coffee and home-baking in this unique venue. Jane will talk about how she learned to make cheese, and how this new venture complements their existing farming business. She will also talk about challenges she has faced along the way so far, and what plans are for the future. Jane hopes that people will ask questions, and she will be interested to listen to opinions, and talk about local food in general, and its availability in Fife in particular.